Roof leaks can lead to all sorts of damage on your home. Even a small roof leak could mean thousands of dollars in damages to the interior of the home if not taken care of quickly. Having a roofing contractor in Brighton Michigan come out to your home and repair your roof is important in order to be able to stop damages from occurring. In this article we’ll go over some of the ways of what may seem like a simple roof leak on your home can damage it. Roof leaks can happen at any time. Although they may happen more frequently during storms and other natural disasters, they may not show up until weeks or even months later. So if your home has a roof leak the reasons may not be immediately apparent. While a roof leak can easily be fixed, it is a time sensitive problem. 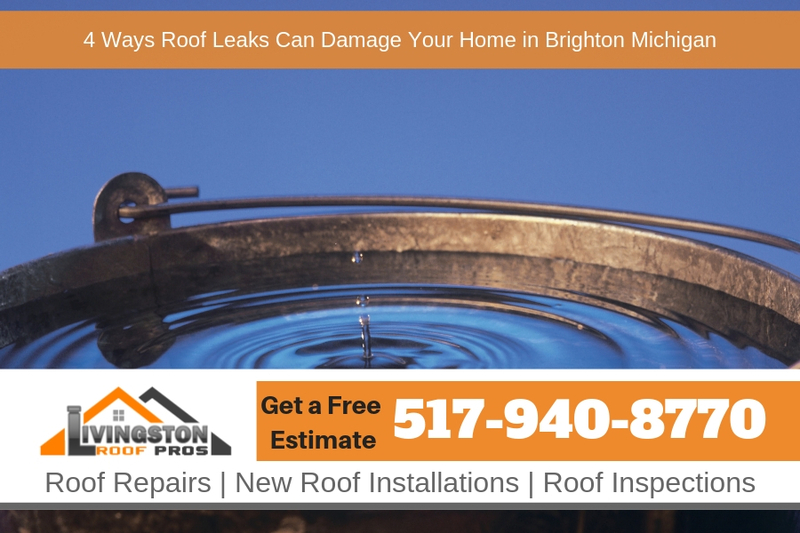 In other words, if your roof leak isn’t fixed in an adequate time frame, then it could cause serious damage. Just continue reading to learn more about the damage roof leaks can cause if they aren’t fixed as soon as possible. When roof leaks happen, water usually drips through your attic and walls. While this usually does not cause immediate damage, it could cause damage in the long run if it’s not attended to in a timely manner. Leaking water is known to cause wood rotting and deterioration, which can be extremely time consuming and costly to fix in the future. Constant roof leaks can cause serious damage to your home’s insulation. If your home doesn’t have adequate insulation, then your roof and walls won’t be able to keep air outside of your home. In other words, it will be harder to regulate and maintain your home’s temperature. When this happens, your heater and air conditioning units will work harder to restore your home’s temperature. While you might not initially notice when this happens, you eventually know when you receive your monthly energy bill because it will most likely be pricier than usual. Excess moisture is the perfect breeding ground for mold and mildew. When roof leaks aren’t fixed, water runs free in your home. If it’s not fixed in a timely manner, then the excess moisture could cause mold and mildew to grow. Mold and mildew usually grow on walls, foundations, and eventually makes it way to your flooring. Not only is mold and mildew expensive and difficult to get rid of, but it also lessens your home’s curb appeal and puts your family’s health at risk. So, if you notice you have a roof leak, make sure you call your roof contractor as soon as possible so you can avoid dealing with mold and mildew. Major roof leaks have the potential of infiltrating your home’s electrical system. When water seeps into electrical wiring, it could potentially cause a shock or fire. Of course, this is extremely dangerous to you, your family, and your home. If your electrical wiring is shocked or catches on fire, your entire home could experience damage, which could be extremely expensive and take a lot of time to fix. One of the biggest concerns about electrical hazards is that you normally don’t know your roof leak has infiltrated your electrical system until a shock or fire occurs. As you can tell, roof leaks are extremely serious. While they initially might seem only like a minor inconvenience, they put your family at risk of health problems and your home at risk of serious damage. That being said, as soon as you suspect your roof is leaking, you should call your roof contractor so they can repair it before any further damage happens.